The Taiwan Dog is a primitive breed that in the past was utilized as a hunting and as guard dog. Today they are primarily kept as companions although some survive as feral on the streets. 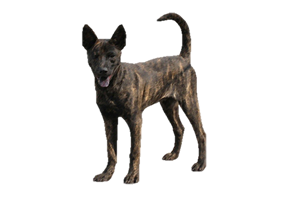 Originally known as the Formosan Mountain Dog, the name was changed due to Formosa being an outdated name for Taiwan. There were once two size varieties of the Taiwan Dog, 16” and 12”. Unfortunately, the smaller size no longer exists. An ancient breed, the Taiwan Dog has existed on the island of Taiwan for centuries. They descend from South Asian hunting dogs, similar to Dingos. The native aborigines kept their dogs in a semi-feral/pariah state. They lived close to humans, yet still apart, and capable of fending for themselves. As their range was restricted to the island, these dogs were pure from outside influences. Taiwan remained isolated until the 17th century when Dutch and Portuguese traders established colonies on the island. The Dutch valued the native Sika deer, sending skins back to Europe. They brought with them a ‘flying dog’, which no record exists as to what this breed was. Some authors have suggested Greyhounds and German Pointers, although it was likely several types rather than a single breed. As the deer population dwindled the colonists slaughtered the aborigines’ dogs to prevent them from hunting. What few Taiwan Dogs survived were interbred with these ‘flying dogs’, making pure specimens hard to find. In 1684 the Chinese overtook Taiwan and their dogs began to return to their pure state. Then in 1895 the Japanese occupied the island and thousands of dogs were again slaughtered. Again, foreign breeds disrupted the Taiwan Dog’s bloodlines. This time the native Japanese dogs such as the Akita and Shiba Inus, as well as European dogs, in particular the German Shepherd were imported. The Chinese returned at the end of WWII, migrating to the island and introducing the practice of eating dogs. Many of the remaining Taiwan Dogs were unfortunately consumed, or now diluted due to centuries of breed imports. What few remained existed only in the mountainous, remote regions with the aborigines. Luck would finally turn on the Taiwan Dog’s side in the 1970s, when at last there was a movement to save the local breed. Today, although still rare, they are stable and have been recognized by the Fédération Cynologique Internationale. Is the Taiwan Dog Right for You?